8 days. 849 meters. 110% pure adrenaline. 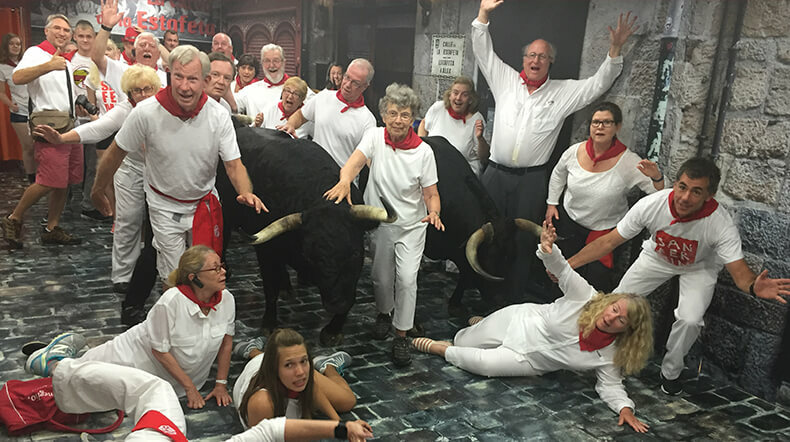 Is the Running of the Bulls in Pamplona next item on your bucket list? Are you and your friends mad thrill seekers? Want to experience the excitement of a week-long festival in the company of locals who know how to play the game? Thinking about navigating your way through a stampede of raging bulls averaging 1300 pounds in weight in a crowded and narrow alley? Or you’d rather just watch from the sidelines? Either case, Pamplona Fiesta has you covered. Learn how to run with us, watch from our balconies, or enjoy one of our guided tours. Watch the nail-biting excitement of El Encierro in this action-packed video. Want to know what others are saying about Pamplona Fiesta? Watch this video. This balcony is a great vantage point along the Estafeta for the running of the bulls. The breakfast spread was a very welcome addition as we had been living on bocadillos and coffee. Also, having knowledge of the bull run tradition and history was a nice touch that enhanced our understanding of the festival. Brilliant opportunity to watch the Running of the Bulls, a bucket list activity ticked! Francisco was awesome in ensuring all the arrangements ran like clockwork, with excellent communication throughout. Thank you Francisco, we will recommend you to all who ask after our experience. VIVA SAN FERMIN!!! It was a great experience seeing the running of the bulls on Frans’ balcony. Both Fran and his wife were so lovely and extremely helpful! Would recommend to anyone!! Life doesn´t get any better or any crazier. This is it. Want to dig a little deeper and discover what the wonderful city of Pamplona has to offer besides fun and games? Read our Blog, watch our YouTube Channel and browse through our Photo Gallery. Tons of quality (and entertaining) information from the locals to you.